What happens at an Amish barn raising? A barn raising is an example of a frolic, a work event that combines socializing with a practical goal. The barn raising fulfills a practical need and also serves to tie the Amish community together, reinforcing Amish society through a very visible expression of the principle of mutual aid. Occasionally, there is a need for a new barn to be build in an Amish community. A farmer may be starting up farming. Sometimes disaster strikes and a barn will burn down. Amish society is based on a Christian belief in mutual aid. Amish church members are committed to helping one another, and put that belief into practice when putting up a barn. Barn raisings are synonymous with Amish life, and have become iconic of the people, often being featured in images of the Amish or portrayed on film in such movies as Witness. 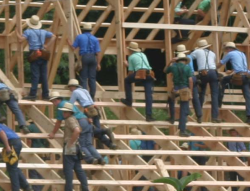 A barn raising is a showcase of Amish planning, organization, and manual labor. Amish tap into the social capital and goodwill in the community, mobilize labor and come together to erect a building which serves as a practical linchpin of their agriculturally-rooted communities. How is an Amish barn-raising organized? Barn raisings require organization, supplies, and labor. 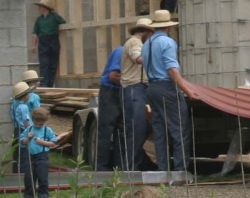 They are typically led by one or two master Amish “engineers”, who lay out plans for the barn and assure the materials are available. Supplies and livestock may be donated by fellow church members. All labor is contributed for free as well. Amish know they may be in need of the community’s help themselves one day. Typically the blocks and cement used in the foundation are laid before the day of the actual raising, allowing time to dry and set. The day of the barn raising, men arrive early. The master organizes men and instructs on jobs, overseeing the whole event. Amish traditionally build barns using wood-peg mortise and tenon joint construction, but may also use more modern materials and techniques. Despite the common belief that Amish do the whole job in a single day, it may take a week or more from start to finish. There are typically a good bit of preparations to be done beforehand as well. However, the wood frame structure usually does go up in one day. Women help by preparing meals for the men. Youth and children participate as well. Hundreds typically attend, either as workers, support, or observers. 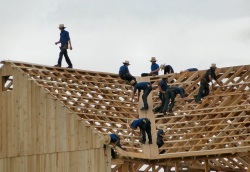 A barn raising is the most well-known example of what the Amish call “frolics”. Amish take pleasure from participating in joint cooperative work projects—both from the social aspect as well as from the deeper sense of satisfaction in seeing tangible results of one’s labor. “We look forward to raisings,” said one Amishman. “There are so many helping, no one has to work too hard. We get in a good visit” (“The Barn Raising”, Gene Logsdon). Amish also feel a deep sense of security in knowing that the community they are a part of will return the favor if they ever find themselves in need. Besides the barn-raising, there are numerous other types of work frolics Amish typically participate in. Quilting bees get women together to do the painstaking work of stitching a quilt, and offer a venue to visit and share news at the same time. Canning, shucking corn and shelling peas are other, smaller-scale occasions when Amish may get together to tackle a task. Frolics for men may involve putting up new buildings other than barns, working on a roof, or other sizable tasks requiring many hands. Word may be put out at the Sunday service of the upcoming frolic, and community members will come as they are able. Despite their iconic nature, barn raisings are not as common today as they once were. This is due to the general decline in farming among Amish, due largely to high land prices. Still, accidents happen and barns burn down, and Amish stil do set up new farms. Thus there remain opportunities to both participate in and witness this definitive event of Amish life. 1 responses to What happens at an Amish barn raising? we have a late 1800 or early 1900 barn that we would like taken down. Do you do this, and if you do, what is the process. Leave a reply to What happens at an Amish barn raising?